One of the nicest parts of the IPPC 2015 were the organization of workshops on diverse topics in plant protection where one could discuss about specific topics and their future prospects. The workshop “Management of Useful Microorganisms in Tropical Soils” was chaired by Mr. Jose Pereira da Silva Jr (Brazilian Agricultural researcher) and by Mr. Falko Feldmann (JKI). At the start of the workshop Mr. Jose Pereira highlighted his experiences made in tropical soils followed by an open discussion about the use of rhizobium, its application to the soil along with the fungicidal side effect on the population of rhizobium. Interestingly, in Brazil 85 million tons of soybeans are cultivated on 24 million hectare without applying nitrogen fertilizer. They are only using rhizobium as plant treatment. The problem that occurred in previous years was that the application of fungicides / insecticides seems to decrease the population of rhizobium / microorganism in the soil, thus reducing the nitrogen fixing capacity of soybean. Unfortunatley, application of fungicides is important to control soil born diseases which otherwise will cause major yield losses. Jose Pereira was able to show that there is no direct effect of the fungicides on the symbiosis process but on the population of the microorganisms. The question was raised from the audience if a lower concentration of fungicide would be okay? Mr. Jose Pereira replied that with less concentration of the fungicide there will be less effect on the population of microorganisms but in return will not control the disease efficiently. 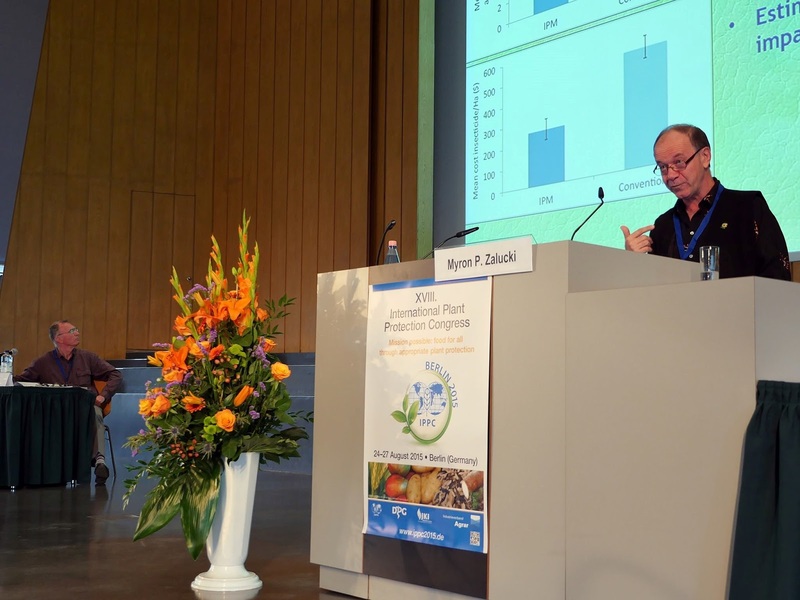 Falko Feldmann asked if it might be possible to separate the fungicide treatment from the rhizobia treatment by putting the rhizobia below the seed so roots can grow to it. Jose Pereira replied that the problem is that rhizobium does not survive for a long time. He tested various fungicides from different companies and developed an application strategy were the fungicide is applied 2 months before rhizobia so it will not affect the population of rhizobia. However, they have to look for new strains of rhizobia every year to get maximum nitrogen fixation. 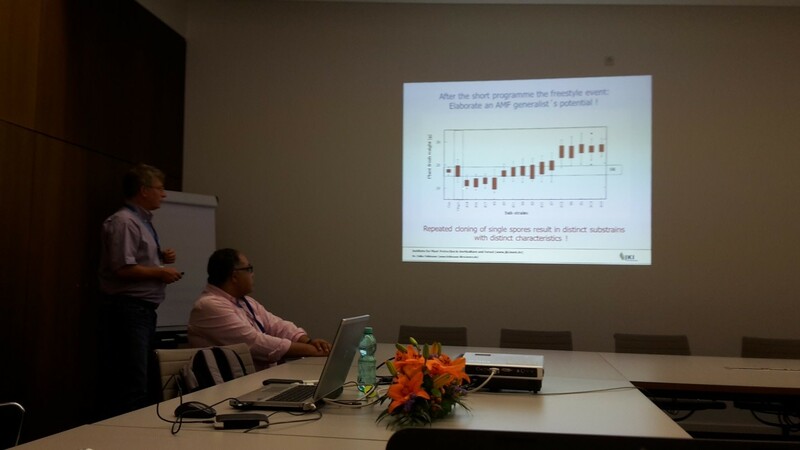 Overall, rhizobia treatment is not so expensive in Brazil as costs for 1 hectar are less than 2 euro and the marginal return for soybeans is higher than for other crops. In summary, the right application technology for fungicides and/or rhizobia will have a positive effect on yield and helps to sustain the population of rhizobia. 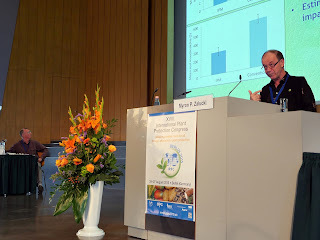 In his impulse presentation Mr. Falko Feldmann referred to mycorrhizae, endophytes and management practices to improve the soil health which in the long term will increase crop productivity and profitability. Additional factors affecting soil health are abiotic and biotic environmental factors as well as fertilization regime. Furthermore, plant roots grown in tropical soil can look absolutely different from roots of the same plant grown under sterile conditions. For example, rubber trees grown in vitro show an intensive and very fine root system, whereas you will never find such rubber tree roots in nature. Especially if in tight contact with mycorrhizae fungi plant roots recycle products immediately after taken up by these fungi and don’t develop in an expansive root system. However, within this context the mycorrhizae genotype plays a major role that needs to be studied more intensively in the future. Then Falko Feldmann enlightened us about the biodiversity as ultimate key to the success of any agricultural system. If we come to know what’s going on in the soil that we are managing, we can use this knowledge for better plant growth. One of the research areas of the future will be the microbiome which will lead us to a complete new way of thinking about plant growth and plant health. In the following discussion the floor was open for questions. One of the aspects coming up was about the general regulation of the bio-fertilizer products in the EU and around the world. Falko Feldmann explained the recent developments within EU regulation regarding the indirect effect of bio-fertilizers on plants. After the workshop we had the opportunity to interview Jose Pereira da Silva Jr and Falko Feldmann. How do you think the future of bio-fertilizers and the application technology of microbial inoculum? Best is to consider all the options that we have for biocontrol. Biocontrol is easy to register and easy to integrate with other measures. Due to a lot of disease surveillance in Brazil one must have to do seed treatment with fungicides which will decrease the population of rhizobium. We have to think more seriously about the application of the fungicides two months before rhizobium application or we will have to rely more on integrated management approaches. 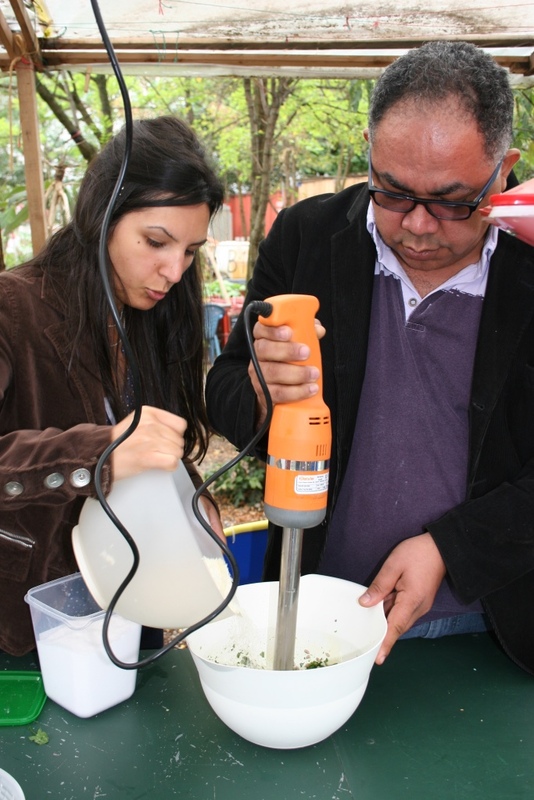 Do you think that management of useful microorganisms can help the farmers in developing countries? Especially for the developing countries it is the solution for a lot of problems concerning photorespiration in plants e.g. as we saw in the presentation of Mr. Jose Pereira regarding cultivation of soybean on 24 million hectare of land without using nitrogen fertilizer. This already saved a lot of fertilizer and reduced the cost for the production of soybean dramatically. If this would be transferred to the other tropical regions of the world it could lead to much higher yields at less costs. It’s not only restricted to rhizobia as there are lots of different microorganism, e.g. N-fixing bacteria and mycorrhizae fungi, that can also play an important role for plant health as well. One option for the future could be to manage the soil in such a way that beneficial microorganisms naturally occurring in the field are promoted by management strategies to increase in number leading to the healthy plant. Young Scientist: How do you see the future of these useful microorganisms in Germany? In Germany microorganism play an important role as component of integrated plant management. We are recently classifying them for their MOA e.g. following the potential they conserved and so on. You may discriminate between direct acting plant protection products used against biotic and abiotic stress and bio-fertilizers which are used as substitute for nutrients. How much this can bring for Germany has been showen by an experiment in East Germany in the 1980s where a lot of fertilizer was saved by using such organisms. This shows that it is also possible in our region, although most likely not for all production systems/situations. However, indirect acting microorganism are recently not finally classified and we are still discussing regulations to discriminate them from bio-stimulants. Young Scientist: What do you think how we can use these microorganisms all over the world with different cultivation systems. These microorganisms are not restricted to any country. You can use them anywhere but what we need it to really acknowledge the importance of these microorganism and to recognize their potential for plant health. Very often traditional farming methods already make use of those microorganisms without knowing about it. For example, the high diversity of cultivated plants in China improves cycling of nutrients. Traditional farming systems have developed over several centuries based on learning by doing. Nowadays, there is the risk of losing the knowledge about traditional cultivation systems and especially the knowledge about microorganism maintaining such systems. We need to better understand how microbial communities can be managed for a better plant health. The percentage of the world's population living in cities increases drastically, year by year. Most citizen loose the contact to the basis of live: food production and what it means to grow a healthy plant. Three different strategies to transfer knowledge in crop plant growing and protection to non-farmers were presented in this evening workshop. José Alberto Caram de Souza Dias, a virologist from Brazil, explained us lively how he came to the ‘Planting Potato With Science’ project. In Brazil, there is a phrase “Go planting a potato” which lead to the humorous project name. The addition ‘with science’ is especially important, because in this school project pupils get also in contact with scientific work for the first time. José’s pupils have to observe and care for five potato plants, where four are healthy and one is infected with potato virus (PYNTN). They can observe the growth of the plants and the disease spreading due to transmittance by aphids. The participants of the IPPC workshop liked this school project very much and thought also about establishing similar projects in their home countries. Mahendra Pratap Sivastava told the audience about the idea of Plant Health Clinics (PHC) to help non-professional farmers. He insists that there are clinics for ill human beings and animals/pets, why should it not be possible to have free (!) PHCs, where diseased plants would be examined and instructions how to handle this disease would be provided. Urban gardens offer also a great possibility for citizens to stay in touch with the nature and the basis of life. Vanessa Hörmann from Berlin presented us the community garden “Prachttomate” (glory tomato) that she and her friends established five years ago. The joint growing of crops teaches people on the one hand how healthy food is produced and one the other hand facilitates the community building which is especially important in big and anonymous cities. 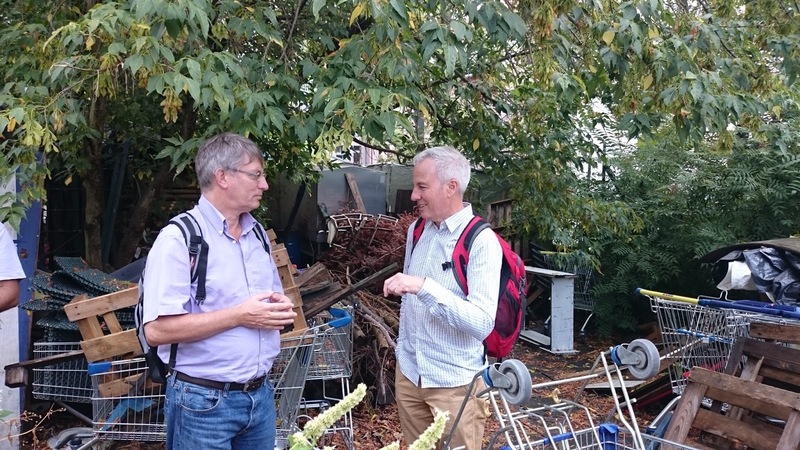 At the Friday excursion, nine participants visited two urban gardens in Berlin. The main aspect was the community building and the plants in urban gardens as a medium therefore. Additionally, we discussed the problems which are related to the production of vegetables and fruits in urban areas, e.g. the problems of residues of pollutants. As this was an excursion of the International Plant Protection Congress, we took a look on the phytopathological situation in those urban gardens and some practical advices were exchanged from one garden expert to another. The first stop was the community garden “Prachttomate” (glory tomato) in Berlin-Neukoelln. 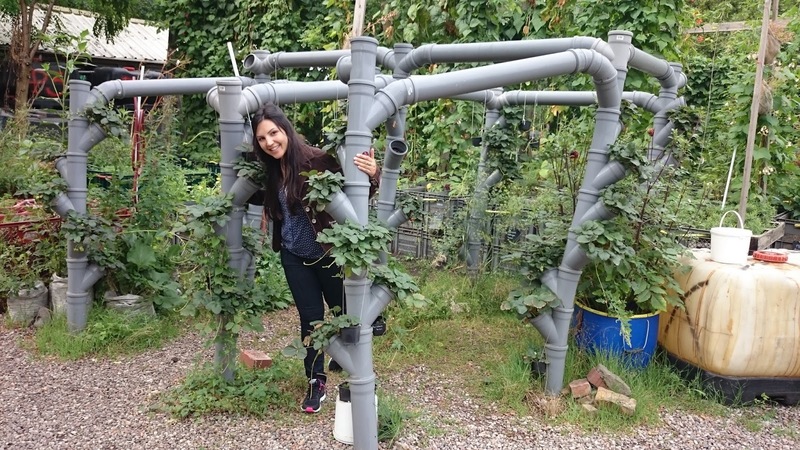 “Prachttomate” gave us a nice insight into urban gardening. 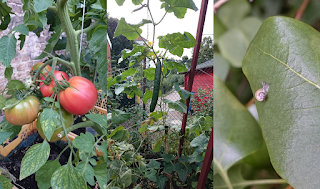 It showed us that it is possible to live in a big city and still have a nice garden producing own food, even though the main idea of such a garden is not actually the food production but more the social aspect. Small gardens as “Prachttomate” give city people the possibility to spend some relaxing time in “artificial” nature, and communicate with others away from the daily routine and stress. It offers a reminder of how life outside of a city could be and encourages cooperation between all participants because the work cannot be done by a single person but requires team work. 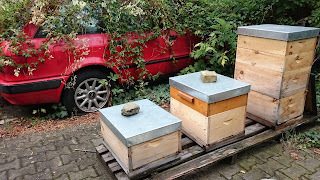 “Prachttomate” is free for everyone to join and to work with the garden-community at two gardening times a week. 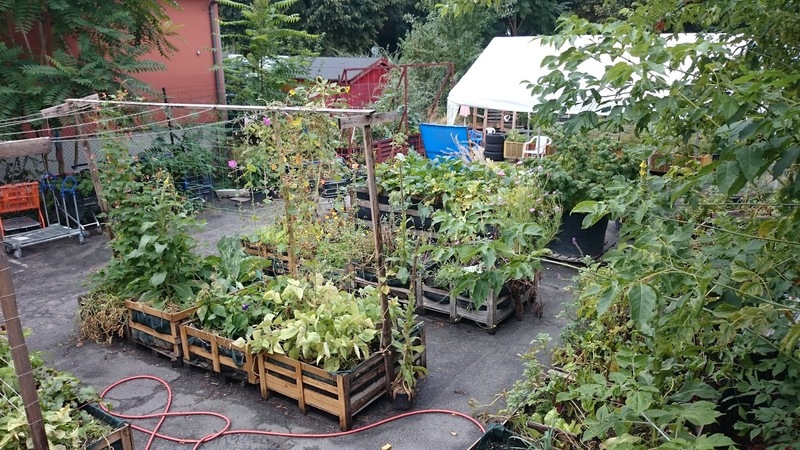 In special projects post-drug addicts, teenager or kids from the neighborhood learn about gardening, botany and bees that are also kept in the garden. The whole garden is a nice and comfy place with possibilities to lay down or even party and barbecue there. It is decorated in a very creative but simple manner so that everyone feels welcome. 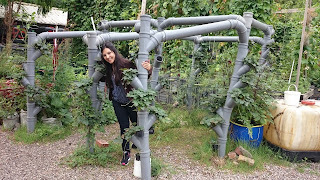 After visiting „Prachttomate“, we went to another urban garden called „Prinzessinnengärten“. 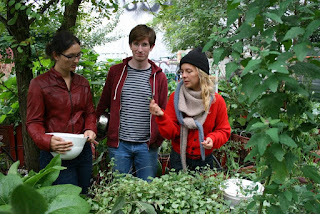 We learned that this second garden resembles in general the idea of switching from our daily routine, concerning consumption and environmental pollution, to a more nature oriented way of living. The idea of the garden is to make city-people more familiar with nature by showing not only adults but also kids different herbs, many kinds of common and exotic vegetables in different unfamiliar colors and shapes (such as tomatoes) as well as exotic fruits from all over the world to illustrate the high diversity of crop plants which is not represented in our supermarkets. Another aim of the garden is to open people’s eyes to alternatives to our daily luxury with the aim to pass into a more “green life”. For that, people have the possibility to buy healthy food and drinks in the gastronomy, to help gardening and buy the harvested food or young plants for their own garden. In addition, a bike workshop is provided, which is accessible to everyone who wants to fix his or her own bike and learn how to fix it by themselves. Even a small house was being built by hand and with natural material in the garden, which was really impressive to see. At the end of our visit we walked around in the garden und picked herbs in order to cook our lunch in a small cozy kitchen in the middle of the garden. We had noodles with our freshly made pesto. One thing is for sure: it was informative, fun and delicious! Day 4: How can a chocolate bar improve agricultural development? Hosting such an intercultural Plant Protection Congress in Germny, it seems to be obligatory to focus on international relations concerning crop protection topics. The main aim of crop protection is improving the quality of life either in a direct or indirect way. We learned from today’s keynote speaker Stephan Krall, German Corporation for International Cooperation (GIZ), that about 795 million people are suffering from chronic hunger and that two billion people are affected by micronutrient deficiencies. As an example, Stephan Krall illustrated that his institution GIZ collaborates with some West African countries to promote cocoa production. This region is the most important cocoa source worldwide and ensures a stable income for farmers. When GIZ noticed, that cocoa growing farmers also grow other crops such as maize and cassava for their own food supply, the corporation started to support and train farmers also in managing these crops. Thereby, the popularity of chocolate and other cocoa products indirectly affected agricultural development positively in that area. However, this does not always seem to be the case. Mr. Kambou from Burkina Faso mentioned that in his country agriculture itself needs to be protected since most people now are trying to search for gold to gain quick money which leads to a neglect of food production and finally to hunger in this region of Africa. 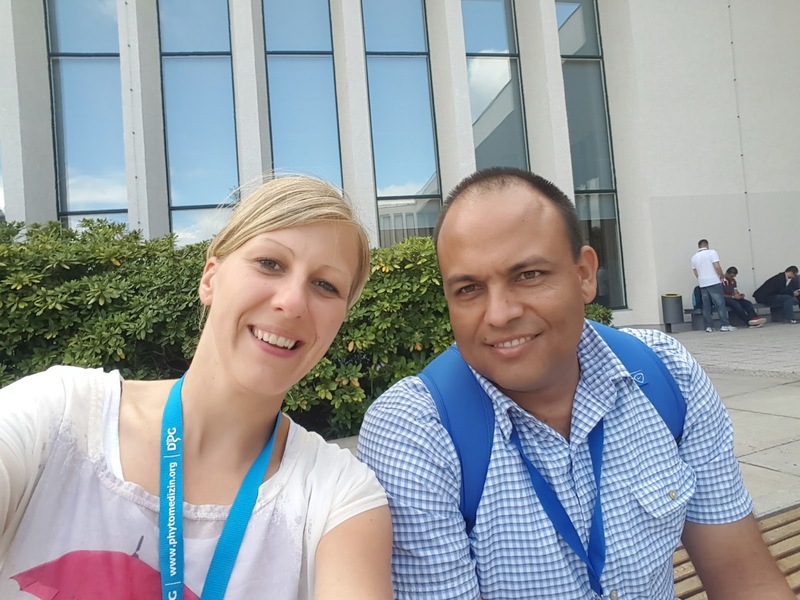 As the GIZ work seemed to be very exciting, we wanted to know more about it, as well as how we as young scientists could support improving quality of life throughout the world via crop protection. 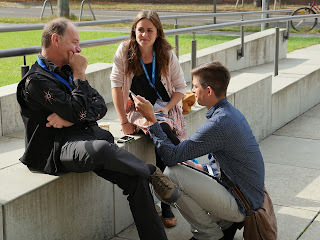 Therefore, we interviewed Dr. Krall, Dr. Jörg Lohmann and Tanja Thekla Pickardt (GIZ). Junior Scientists: What is the role of science in developing extension programs? Pickardt & Lohmann: First of all the role of science is to work with private extension services to coach trainers to work in foreign countries and give advices to farmers. The role of science in developing extension programs has recently changed from research for development into research in development. Linear science forgetting the practical work causes more damage than help. Finally, extension services influence the research to be more practical. 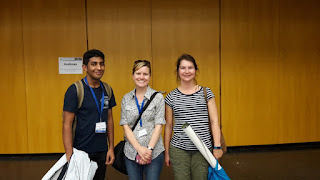 Junior Scientists: Mr. Ketelaar (Bangkok) mentioned in his abstract that the most hazardous pesticides must be eliminated and that there is a need for environment-friendly alternatives. In addition, organic food seems to be trendy in Germany. Is this opinion also representing the view of Asian population? Do you think that there is a general tendency in the world toward organic food? Pickardt & Lohmann: So if you think about the growing world population, especially in developing countries, organic production is not necessarily an alternative for everything. It depends very much on the place where you want to produce. For us organic agriculture is good and it is supported, but it is not the only way to produce. We have to value organic agriculture in a broader way. If mineral fertilizers and pesticides are used in an appropriate way, food can be produced in a sustainable manner. We have to find something between providing the population with food on the one hand and conserving the environment on the other hand. Junior Scientists: Do you think that the misconception towards crop protection in Germany is also wide spread in developing countries? Krall: There is a broad spectrum of developing countries between one has to differentiate. In some African countries for instance, there is a lack of plant protection and fertilization. In such countries it is not always wise to supply farmers with pesticides as they are not trained to use them and thereby their availability could be dangerous for people’s health. In various other countries, pesticides are applied but they are not used in the prescribed manner. In such countries, training people seems to be the better option than switching to organic farming. Junior Scientists: There are a lot of conference contributions from developing countries that deal with biocontrol agents. Do you have any suggestions concerning this strong demand? Did it increase in the last few years? Pickardt & Lohmann: We can verify that there are many contributions dealing with biocontrol agents. Consuming products contaminated with aflatoxin for instance, may lead to various diseases such as liver cancer. Biocontrol agents can be one approach to fight aflatoxin producing pests. (Workshop Tuesday evening, “Aflatoxin Prevention in Sub Saharan Africa- Challenges and Practical Experience”). Organic farming is not always cheaper, not always easier, but can be an opportunity. Junior Scientists: Transfer of knowledge between research and practical farm work seems to be problematic in many regions. What do you suggest to improve this problem? Pickardt & Lohmann: First of all, research findings often end with conclusions directed to other scientists lacking the information relevant for practical application (farmers). All agricultural actors are playing a role and therefore all players in innovation systems need to be considered. A good example for supporting knowledge transfer is the school for innovation, which improves the daily living conditions in Africa. For developed countries the value of an innovation might not be significant, but it could be a solution for developing regions. Keep this in mind! Junior Scientists: How can young scientists contribute to a better understanding of crop protection in society and support solving actual and practical issues? Krall, Pickardt & Lohmann: The point is to be open-minded and to get your own impressions. Furthermore, practical development cooperations and NGO’s are important to break narrow-minded opinions. If this is successful then we can get rid of the DDT burden for example. It is your turn (i.e. Junior Scientists) to come up with new opportunities, your time to change things, your time to be open minded. Talking to people from the society to clarify some misunderstandings is very important! Junior Scientists: If we, as young scientists, want to support international interaction, how could we accomplish this? What would be the first step? Krall, Pickardt & Lohmann: Work for GIZ ;). Our suggestions would be to join international student organisations, keeping contact to international partner universities and participating in big international conferences like the IPPC or the Tropentag to make your own experience! Coming back to that chocolate bar story: The Mars company is very interested in producing a nice and tasty chocolate bar. For achieving this, they support ongoing research on rice - so in a wider understanding: A chocolate bar did indirectly improve agricultural development. By the way, the GIZ offers opportunities for internships and theses for young scientists! Junior Scientists: The next IPPC in 2019 will take place in Hyderabad, India, with the topic “Crop protection to outsmart climate change for food security and environmental conservation”. Since India started to tackle the problem by a national action plan on climate change (NAPCC). Is this a good opportunity for the country to get support and more attention? Pickardt & Lohmann: What we have to keep in mind is that on one hand it is very expensive for a country to hold an international conference like this, but on the other hand it is a great chance and opportunity for India to get together all the different and international researchers. India can present its problems and approaches, which might be a good opportunity to get support and attention. In addition, India is one of the hotspots affected by climate change. Finally, maybe the approaches that India itself has developed might surprise the most. Junior Scientists: Thank you for your time and the nice exchange! Note: The interview does not reflect the interviewers answers word-for-word, but it rather summarizes their main statements. Later that day a Scientific Networking Meeting took place, in which different representatives of scientific associations took part. We were curious what participants would answer to the question in which way the IPPC can contribute to improve food security. 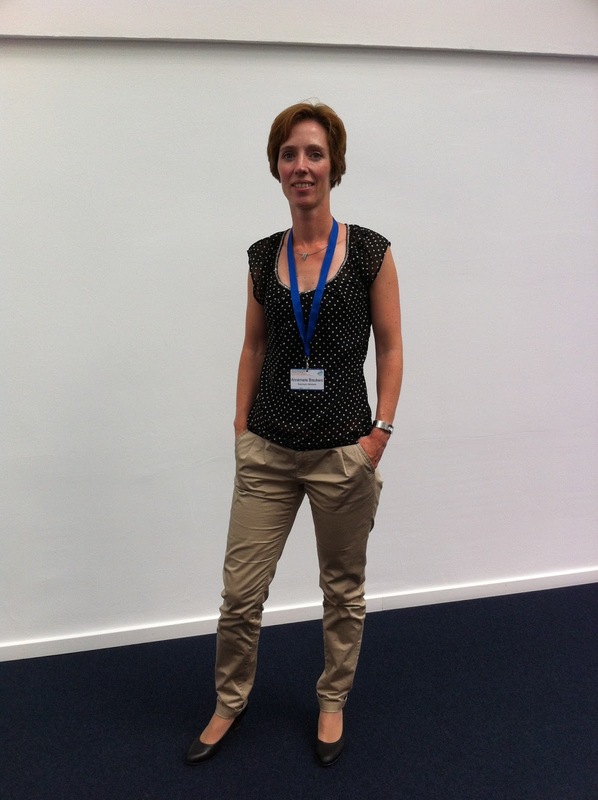 Kindly, Annemarie Breukers from the University of Wageningen (NL) expressed her personal opinion that the most important thing about such a congress is to bring all the people together and to get the opportunity to build up personal contacts. The theoretical scientific information can always be gathered at home behind the desk she said, but it is about exchanging personal experiences and thereby to fill the gap between theory and practice. Blog was written by Katrin and Rania (Student Reporters DPG). 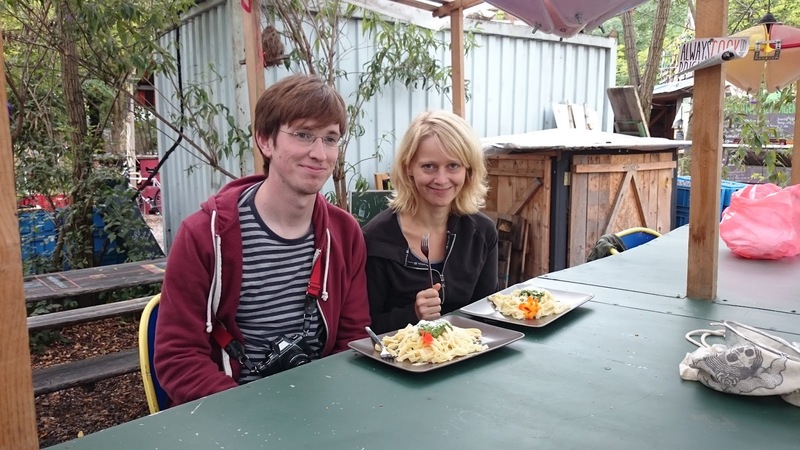 Fotos were taken by Philip Jarkusch (Conventus) and Sebastian Streit (Student Reporter DPG). 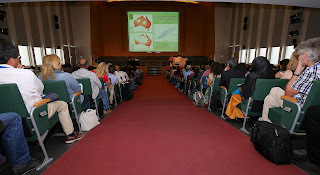 In his talk “Landscapes, genetically modified crops and climate change: Whither IPM?” he addressed the topic of integration and precision in two case studies, Helicoverpa management in cotton and Plutella xylostella in brassica vegetables in Australia. The cost and usage of plant protection agents in Australia is increasing while agriculture is facing a drastic change in environmental conditions, not only by the ongoing climate change. Therefore, it is necessary to prepare for new pest control scenarios. Further on, he highlighted a repetitive problematic procedure: when spraying fails, risk management is being conducted, followed by returning to the old practices, which initially caused the problem. Of particular interest was his finding, that the introduction of GMO cotton significantly affected the North American population of monarch butterflies, as a side effect. His talk clearly indicated the need to be aware of upcoming changes in plant protection induced by the ongoing change of the environmental conditions. 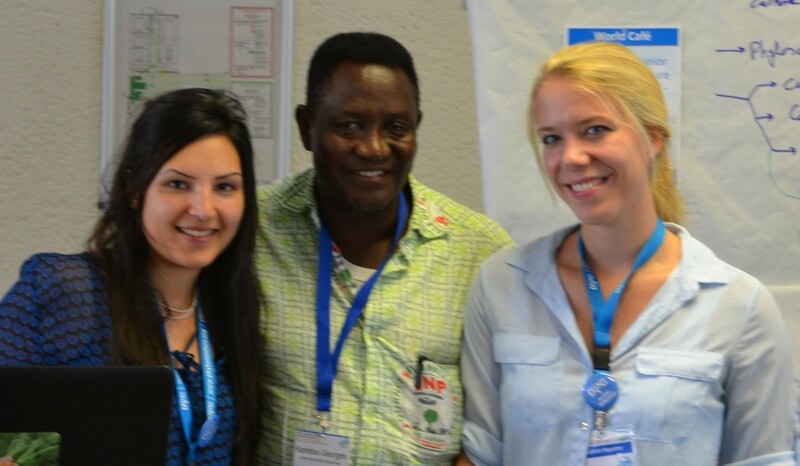 The slogan of this years´ IPPC is „Mission possible - Food for all through appropriate plant protection“. Do you think IPM strategies are a promising approach to achieve this goal - even in terms of climate change - and why? IPM is an approach for pest management, its idea is to minimize the pest pressure and maximize yields without disrupting life, environment and universe. All IPM systems have to be aware of the valuable impacts of climate - in some parts of the world even more than in others. It´s a system that always has to adapt to the given circumstances, because agriculture is always developing. Indeed, food security is the major goal to achieve in future - therefore agricultural production systems are one part, as well as efficient political systems to ensure that those systems are admitted and can be applied. 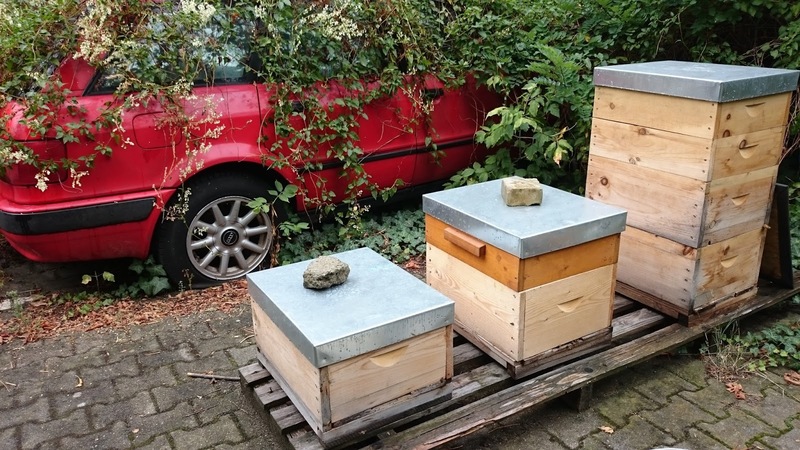 Where might be limitations of IPM? The limitation of any approach is always its implementation. The issue is how do we change the way people approach agriculture and management, so that they see a benefit in doing things differently. Which steps are most important to take within the implementation of IPM all over the world? Encourage education - the ability to question knowledge - is to mention first, as well as the obligation to get researchers and research institutes more involved with local farmers to really detect the problems they are faced with. Other aspects are changes in politics and industry. The problem in politics is that it´s too opinion-driven and short-term for extensive agricultural changes, that take longer periods to be established effectively. Do you assume that todays plant protection practices are able to adequately monitor, identify and react on alternating pest situations induced by a change of the environment? That is what you do, but is that also generally done? Growers in the field that detect unknown pests/diseases will alert researchers of these changes. Afterwards people can map changes over the years and create huge databases, which I generally would advice. In addition to this, we also need policy makers, who enable new research projects. In your talk you brought the example of GMO´s introduced in the cotton belt in the US resulting in a decrease of Monarch butterflies. Are we capable of identifying changes and their putative effects on this scale? The sad part is we really should have been able to foresee this ahead of time, but we didn’t. That is one of the big challenges for researchers and policy makers. When a new technique to cope with diseases is established, we have to think about the effects it has. A measure of how good science is, is whether it can make predictions over time or not. We have to keep this in regard for future projects. From Myron Zalucki´s talk and the interview with him it became clear, that we need to adapt to a changing world, changing people, landscapes and agriculture. To really progress, we have to be open-minded regarding revolutionary techniques that could help us to ensure food security on earth and in the same way pay enough attention to possible risks that might come with these techniques. The precision farming session 2015 gave us an overview about the current focus of spray application research. Jens Karl Wegener from JKI addressed application problems in vertical crops, such as streaking. He presented the individual influence of nozzle type, nozzle to target area-distance, air assistance and application pressure, underlining that all these parameters interact. Tanja Pelzer, from JKI, was addressing the goal of the national action plan for sustainable use of plant protection agents, by her research on optimizing gap detection and switching system in grapes. Herein, proceedings in sensor technologies provide promising perspectives. Stefan Kiefer from Amazone initially introduced us into the influences of dewfall on spray applications, correlating lower levels of humidity with decrease spray application efficacy. His results display differential new situations, thus humidity levels within 24 hours. The very basis of a successful pest control is an efficient disease monitoring, according to the actual state of the art. Here we achieved great insights into current high-tech approaches, involving hyperspectral imaging, IR-thermography and unmanned aerial vehicles. At this point agriculture forms a brilliant conjunction with modern technologies. Disease distributions in the field are heterogeneous. 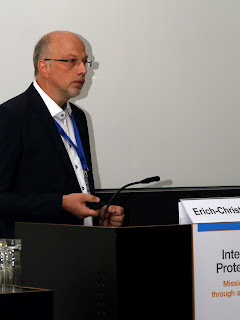 In this respect Erich-Christian Oerke provided a detailed overview about actual sensor technics, outlining method specific capabilities and limitations. Host-pathogen interactions differ in time and space, resulting in distinct hyper spectral signatures of diseased plants. This enables Anne-Katrin Mahlein to use Hyperspectral imaging for identification and quantification of different leaf diseases such as net blotch, rust and powdery mildews in barley. Additionally, Nadja Arens demonstrated how Cercospora beticola infections can be identified by making use of the differential leaf metabolism. Afterwards, Ali al Masri presented his IR-thermography studies, thus measuring the surface temperature of objects. This approach is capable of detecting different Fusarium ssp. in early and late infection stages. Last but not least, Luis Martins presented how model airplanes can be used to observe the pest situation in chestnut trees in large areas. After a remarkable day as student reporters at the IPPC in Berlin 2015, we´re now looking forward to give the day a perfect end in networking with you at the dinner of the social evening. On Tuesday, the DPG Junior Scientists invited to a World Café round table discussion at the IPPC 2015. Participants from all over the world came together and joined on three different tables, each table representing a different topic related to plant protection. After introducing themselves they exchanged their opinions on the specific topic. When time was over after 15 minutes, they had to move on to the next table/topic. Marlene and Alexander hosted the discussion on the first topic addressing the role of Junior Scientists in future plant protection. The young scientist described their own actual situation and difficulties they are facing day by day and in general. Junior Scientists, especially from developing countries, stated that it is difficult to get traveling funds to participate in international conferences. However, the continuous communication between international colleagues and the establishment of networks was seen as very important. According to a young scientist it is very helpful to have a mentor who supports you and introduces you into existing networks. The participants whished that the contact persist beyond the time of a conference. New media platforms may provide a good opportunity to ensure a lasting exchange. The opinion, that there is quite a lot good research in plant protection all over the world was broadly accepted, but according to many participants, future food security can only be achieved with more solution orientated results which are practicable for farmers. In addition, innovative and individual research may only be possible with reliable and continuous financial support and with less pressure to publish. The second round table discussed quite controversially the use of synthetic plant protection agents. This discussion was led by Sabine and Roman. Most participants agreed that it is not possible to secure food for all without synthetic plant protection agents, but the goal still should be to reduce its use to a minimum. However, yield and quality is important for farmers. The research on efficient biocontrol agents and the possibility to combine them with chemical control agents was seen very important. The realization of IPM strategies was mentioned often and the education of farmers as basis for adapting IPM in the long term. Lyhlea Metha said (1999) "The new role of World Bank is supposed to include not only transfer capital to developing countries but also to close the gaps that exist in the level of knowledge". This was the opening statement for the world café with the third topic: “Global food security through knowledge exchange: fact or fantasy”. The participants were mostly international and their contributions in this meeting met their need which made the discussion very important. In the end, many thanks for the great participation and sorry for those who did not find their contribution in the current report. 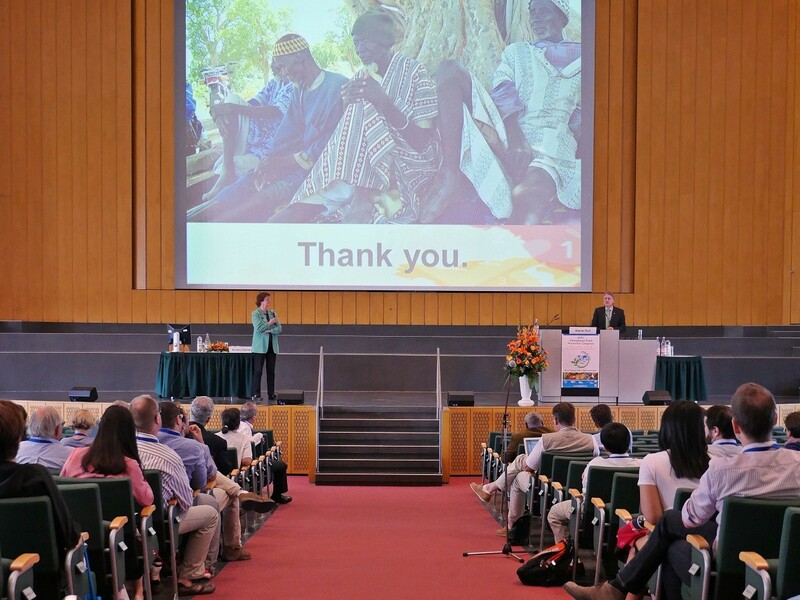 The second day of the International Plant Congress 2015 in Berlin was incented by the slogan, Tradition & Innovation. 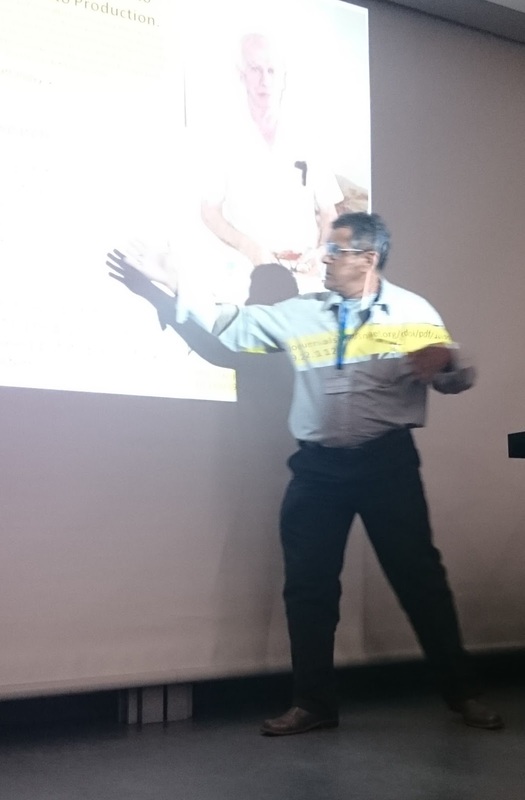 The day startet with Patrick Schweizer, an expert in Biotechnology, as a keynote speaker with impressive information about functional genomics approaches for durable pathogen resistance. His work reveals astonishing examples of the innovative character of plant protection. Nevertheless, it also became clear in this section that besides genetic resources, traditional breeding strategies still contribute significantly to durable crop protection. I. What is the role of junior scientists in future plant protection- revolution or conservation? II. A world without synthetic plant protection agents – future or fiction? III. Global food security through knowledge exchange – fact or fantasy? From the World Café it became clear that knowledge transfer and networking across disciplines are the key issues to develop future plant protection strategies. Those key issues were also emphasized by Mr. Geoff Norton, the President of the International Association of the Plant Protection Sciences (IAPPS). We had the chance to meet Geoff Norton for a interview. How important is it for researchers and stakeholders to link tradition and innovation? Wow, that is a big issue. I think that there is not enough done. The importance is the understanding of the full dimensions of the problem. So, an Entomologist would see the insect problem, who works on population dynamics in detail but he would ignore what the farmers would do and are interested in. It is important to identify research priorities in terms of what the problem is. In terms of innovation, they have to take place like smartphones. But the important thing is to identify of how does that innovation fit? There are only very few people, who are able to do so. That´s a big issue. In Australia for example, a lot of people are working in plant protection go into molecular. That´s the new thing because of it’s high profile; working in the field is not seen as attractive. There are less people going into the field and can identify pest, diseases and weeds. What is the future challenge for plant protection worldwide? This is a big question. The integration of how thing are changing. For example climate change. How flexible can we be in terms of changing scenarios and funding? Flexibility is the key thing in the future. Farmers must be flexible, if there are new problems arising. What kind of output do you expect from the IPPC? Well, a better understanding of the multidiscipline complexity. A lot of people spending a lot of research time working out monitoring techniques but when you actually looking at what is happening, there is very little happening in terms of scouting. Well, it all goes back to the integration of the very specific topics to understand the whole systems of agriculture. What would you recommend to young researchers in their early steps of their career? First, what they are interested in the most. What they get funding for. Well, I´d like to solve the real problems. There is quite a lot of work that is under the plant protection label, which probably it too theoretical. But finding out what the real problems are. I got a lot of satisfaction, when working on real problems rather than theoretical problems. The theory of ecology is one thing but practical experience in your research field is important. Inspired by the statement of Geoff Norton to solve the big problems by networking we wanted to know what visitors expect from the conference. We met Yeriko Obregon (33) from Mexico. He was impressed by the IPPC presenting a very brought and high standard in technological aspects covering all aspects in plant protection, maybe the highest technology on the world. That is the reason why he visited this conference to transfer his knowledge. His research is about herbicides, Yeriko visited Europe for the first time. He is planning a city tour after the congress to explore Germany. 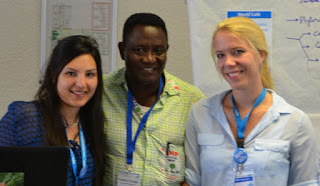 We also met people from Kenya, Burkina Faso, Indonesia and Marocco. 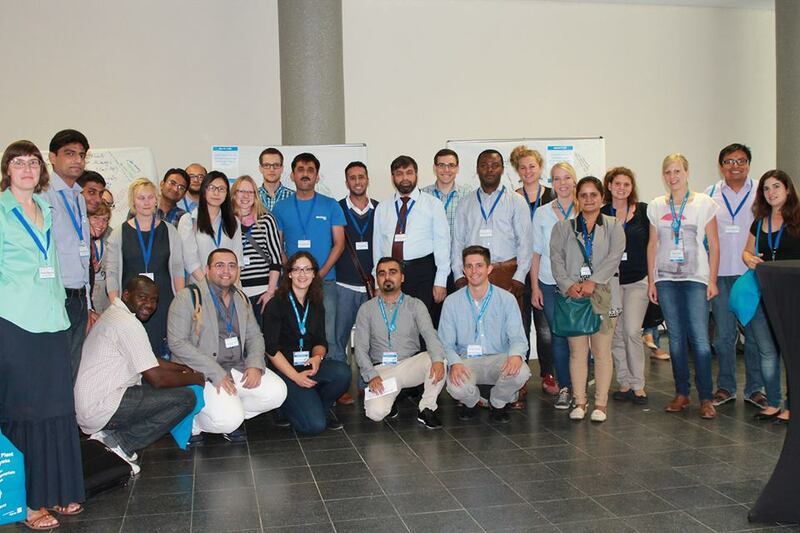 All of them focused on networking to establish research cooperation in the context of non-chemical control options. They argued that the big problems could only be solved in a multidisciplinary manner. We hope you enjoyed the second day of the conference and learned about the opportunities to link between traditional and innovational plant protection. If we talk about Food security, we also have to talk about Plant Protection. In the Workshop „Food Security - the Role of Plant Protection“ of the 18. International Plant Protection Congress (IPPC) ten people of important institutions from eight countries presented their work and role in Plant Protection. The chairman of the workshop, the entomologist Elvis A. Heinrichs from the University of Nebraska (USA) guided this interesting and really important workshop. The first speaker, J. E. Bowman from the United States Agency of International Development (USAID), presented the role of Integrated Pest Management (IPM) in USAID´s “Feed the Future” initiative. “Feed the Future” is an U.S. Government leadership to fight global hunger and improve food security in countries of Africa, Asia and Central America. The “Feed the Future” agencies work hand-in-hand with partner countries to develop their agricultural sector and the IPM plays an important role. IPM means to decrease or eliminate the need for expensive agro-chemical inputs, while maintaining or increasing yields, enhance environmental sustainability, but also to improve the farmer`’s income. IPM tools like insect/plant hormones, biopesticides, precision pest modeling at farm level, and broader spatio-temporal modeling at landscape scale can be combined to achieve maximum impact in agroecological production zones. “Feed the Future” will be supported by U.S. universities, National and International Research Centers, U.S. Department of Agriculture (USDA), and the local and international private sector. Marlene Diekmann from the German GIZ (Gesellschaft für Internationale Zusammenarbeit) presented projects currently funded by GIZ which play a role in Food security and Integrated Pest Management. 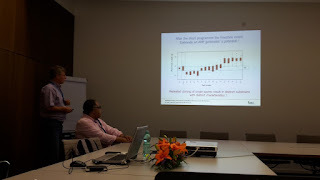 Hari Sharma from International Crops Research Institute for the Semi-Arid Tropics (ICRISAT/India) explained effects of global warming and climate change on insect pests, crop pests, plant resistance, pest management and bioefficacy of insecticides. The global change will engineer a change in the relative composition of herbivores and carnivores. And disrupt the balance between the insect pests and the natural enemies. Global warming may results in breakdown of resistance to certain insect pests. The relative efficacy of bio-pesticides, natural plant products and synthetic pesticides will also change as a result of climate change. There is a need to have a concerted look at the effects of climate change on IPM technologies, and devise appropriate strategies to mitigate the effects of climate change on crop production and food security. H.R. Macauly, General Director of the African research organization “AfricaRice” presented the role of food security in Sub-Sahara Africa and the development in the rice production. Zhou Xueping from the Institute of Plant Pathology at the Chinese Academy of Agricultural Science gave an overview of the most important plant diseases and insect pests and the distribution in China. Overusing of pesticides caused seriously problems in China. Pesticide contaminated soils, crops and a decreasing biodiversity induces China to a national strategic plan to reduce pesticides. CropLife International is a global trade association which represents the interests of the leading pesticide and plant science companies. 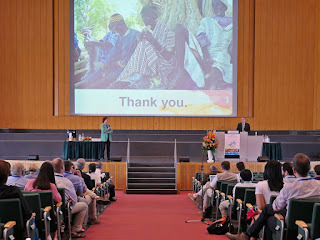 K. Jones, the Director of CropLife, presented their work to food security. Food security means also a proper handling with pesticides. CropLife is focused on training to the proper use of pesticides. J.W. Ketelaar from the Federal Agricultural Organization (FAO/Thailand) presented “Save and growth – A policymakers guide to the sustainable intensification of smallholder crop protection”. Dr. Bilal Khan from the Department of Entomology of the University of Agriculture in Pakistan described a new predatory mite species of the genus Agistemus (A. burewalaensis) as a bio-control agent in Pakistan. Dr. Karim Maredia from Michigan State University (USA) presented different programs for the education about food global food security at U.S. Universities. T. Walter from the “Identification Technology Program” (Colorado/USA) and G. Norton from the Universty of Queensland (Australia) presented different digital technologies for pest identification and diagnosis.